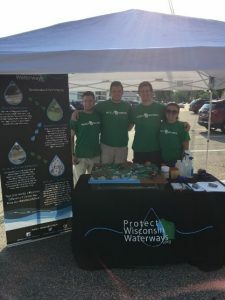 The Protect Wisconsin Waterways crew had a successful event at the Fort Atkinson farmers market on Saturday, June 16, 2018. Our representatives engaged with citizens and families that share common interests in sustainable practices. We showed people the adverse effects of stormwater and what they could do around their home to help prevent these effects. Our mascot Splash was a big hit, especially with children and families. During this event, Splash drew attention walking around and was even asked to stop in a local coffee shop for a birthday party! We also met with someone who has connections with NASA Water Safety Science Projects. 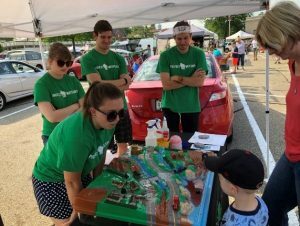 The Enviroscape showed event attendees the many pollutants of stormwater. Attendees also received pamphlets with more information about protecting stormwater.